What if the Druids had been boshing mind-bending chemicals instead of practicing witchcraft and dabbling in ancient soothsaying? What if fat Elvis was doing a residency at Stonehenge — or if summer solstice came with a side order of Britney? 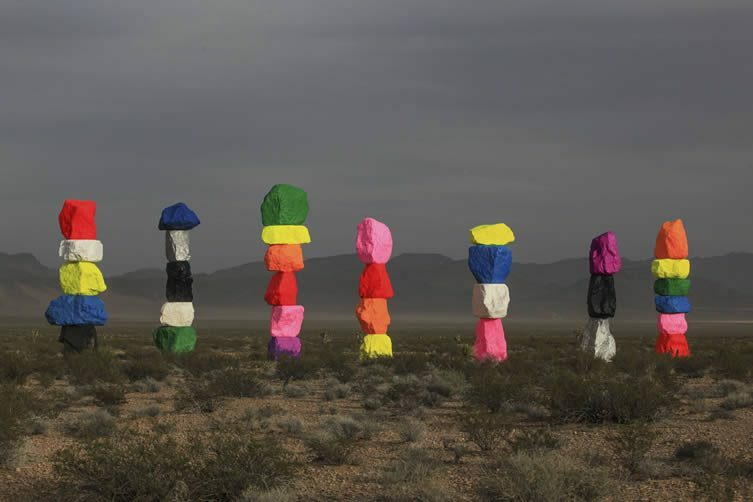 In his Seven Magic Mountains, esteemed Swiss artist Ugo Rondinone has sprinkled some of Las Vegas’s stardust into the dramatic Nevada desert; 35ft-high stacks of locally-sourced boulders rendered in fantastical dayglow … totem poles for the EDM generation. Rising high above the desert landscape along Interstate 15, the uncompromisingly barren drive between Las Vegas and Los Angeles, the New York-based artist’s evocative works talk of the uneasy balance between the power of nature and the overtly artificial aesthetic of Sin City. 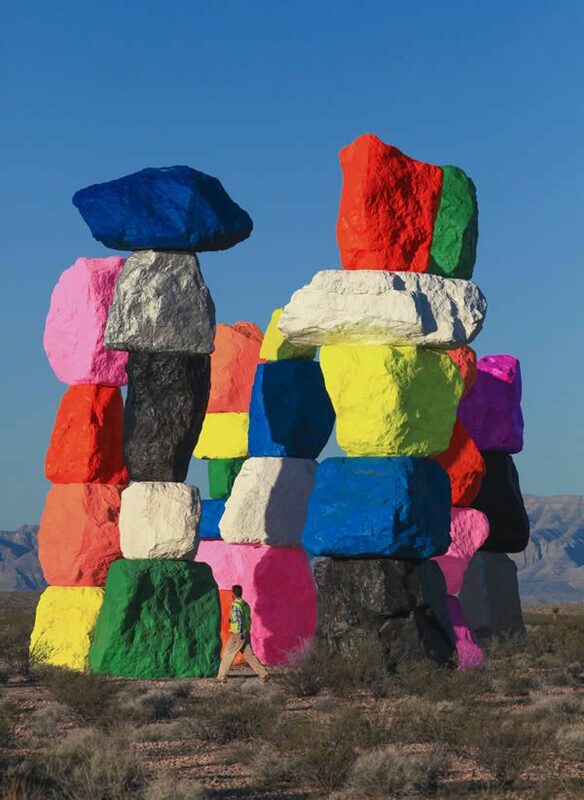 Produced by Art Production Fund, New York, and Nevada Museum of Art, Reno, Seven Magic Mountains is close to Jean Dry Lake; the site of legendary 1960s ‘earth-art’ installations by fellow Siwss Jean Tinquely and American Michael Heizer. 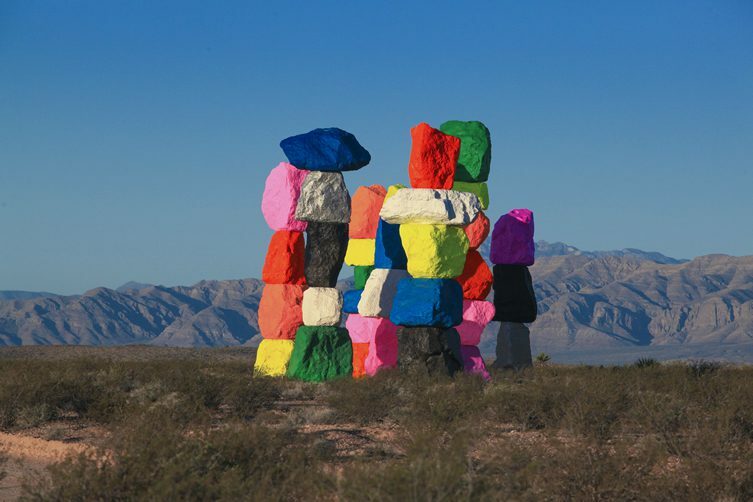 In a time where our interaction with nature is under constant scrutiny, when we push our interaction with earth to the limits, Rondinone’s work symbolises our anxious relationship with the natural world — manifesting the awkward juxtaposition that is Las Vegas, and daubing the arid Mojave with a psychedelic representation of the human footprint. 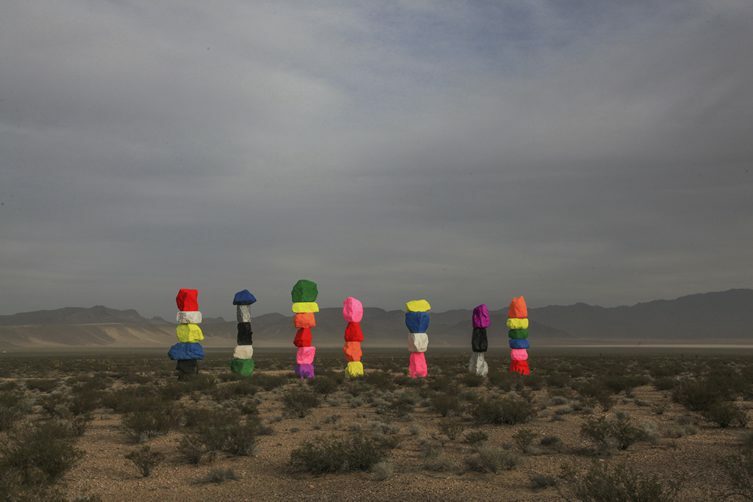 Ugo Rondinone: Seven Magic Mountains, Las Vegas, Nevada, 2016. Photography, Gianfranco Gorgoni. Courtesy of Art Production Fund and Nevada Museum of Art. Hitching across the United States, a very different kind of travel guide. Part Three.